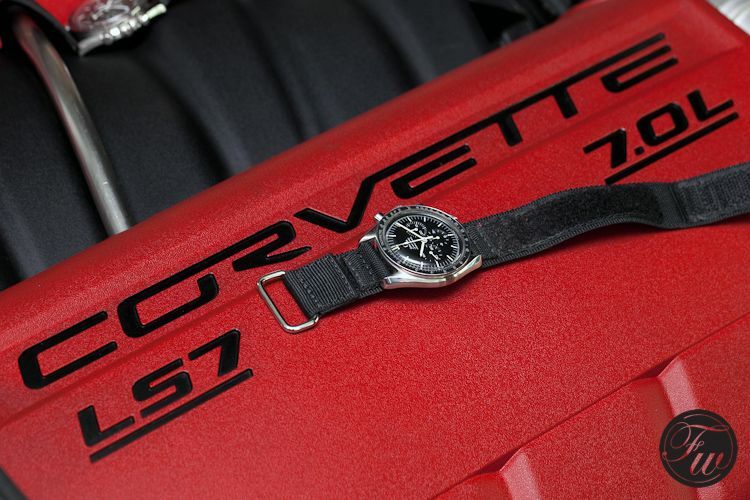 OMEGA Speedmasters And Chevrolet Corvette – An Odd Combination? We Don't Think So! If you’ve ever been to NASA’s Kennedy Space Center recently, watched the Apollo 13 movie or.. even better.. witnessed it yourself, you know that the NASA astronauts used to have a strong preference for Chevrolet Corvette sports cars. The picture above shows the Apollo 12 crew with their beloved Chevrolet Corvettes. 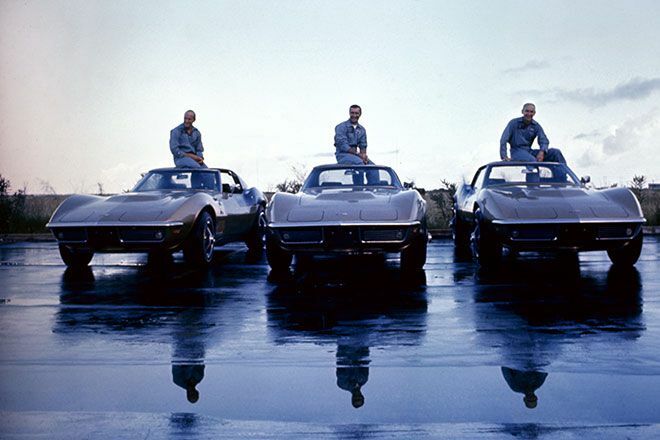 Astronauts Charles ‘Pete’ Conrad Jr., Richard Francis Gordon Jr. and Alan LaVern Bean with their 1969 Corvette Stingray coupes. Wired magazine did a nice article on NASA astronauts and their Corvettes last year, from which the picture above was taken (click here). 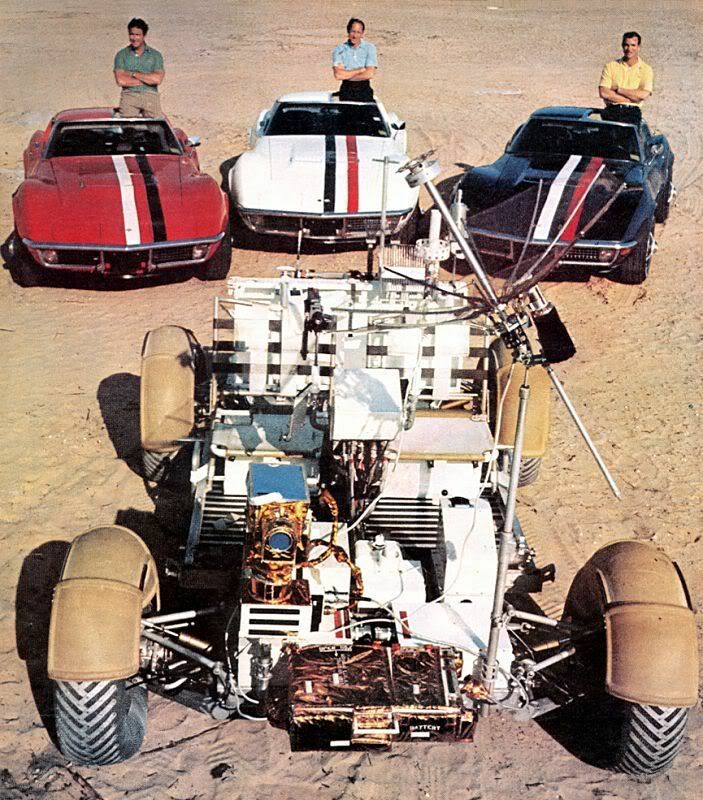 In the book ‘Last man on the Moon’ by astronaut Gene Cernan, he also refers to the Corvettes several times, being the choice of the NASA astronauts. Just like the Speedmaster Professional watch by OMEGA. 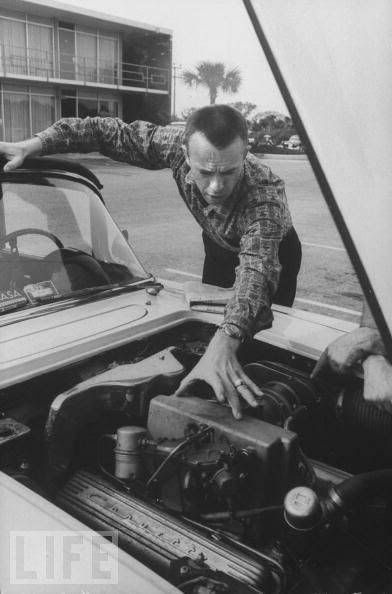 Below, a ‘still’ of the Apollo 13 movie, Gary Sinise playing the role of astronaut Ken Mattingly leaning on the roof of his Corvette and checking the time on his OMEGA Speedmaster Professional. 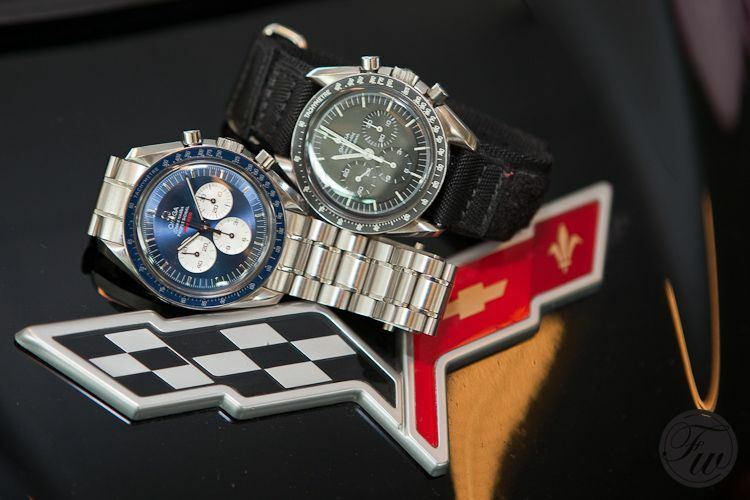 Although when it comes to a true watch – car comparison, I’d probably say that the Speedmaster (pre-)Professional is to watches what the Porsche 911 is to cars. Anyway, to stay in the context of astronauts and their toys, we (Dennis, Bert and RJ) took our Speedies and started looking for a Corvette ourselves. This rather uncommon care here in Europe was not very easy to find, let alone finding an old / vintage model Corvette. In the end, we found a modern Chevrolet Corvette and although it lacks the very cool design of the 1960s models it does breathe performance and strength. We have been looking for vintage ads and photographs of the Corvette featuring astronauts and found this one of Alan Shepard (Mercury-3 and Apollo 14) and his Corvette. His Corvette is now in the Kennedy Space Center’s Visitors Complex in Florida. 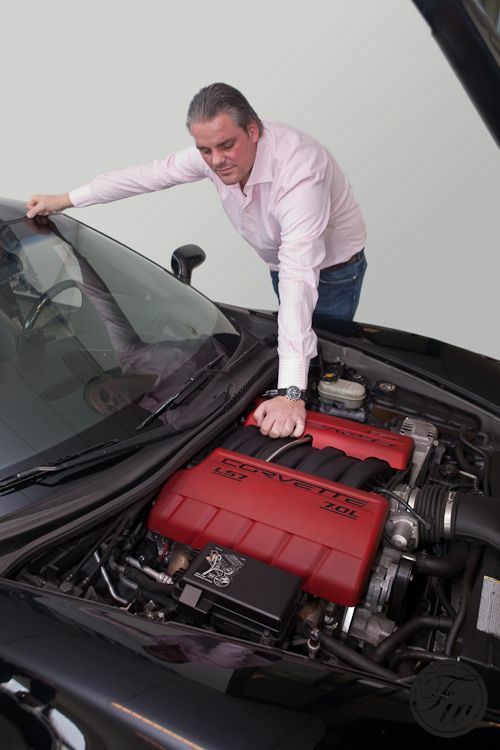 Below, Dennis and the modern Corvette but at least wearing a vintage Speedmaster Professional on a velcro strap from GasGasbones. 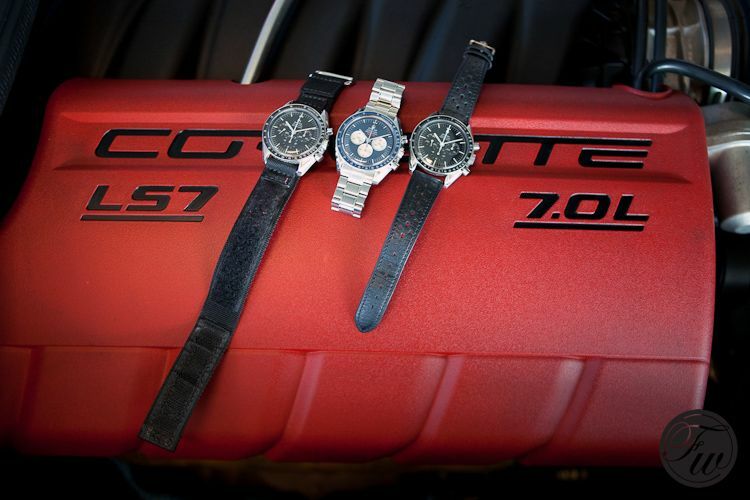 On the engine, from left to right, a Speedmaster Professional 145.022 from 1971, a Speedmaster Professional Gemini IV Limited Edition of 2005 and a 1968 Speedmaster Professional 145.012. Although we weren’t very enthusiastic about this modern Corvette (except for Dennis), we understand the passion these astronauts had for these old Corvette Stingrays. 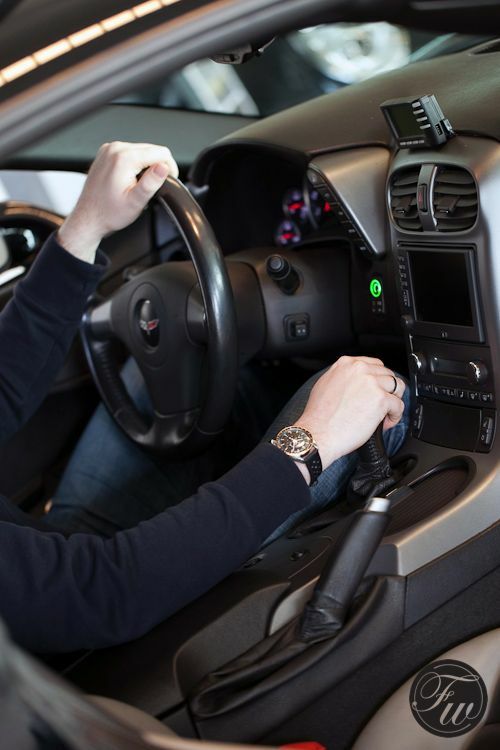 They look more sophisticated than the new models and probably had a more sober – but less plastic – interior as well. The superb design of the Corvette Stingray is hard to beat and it is the only Corvette we would enjoy having in our possession. Like many things, the modern stuff can’t live up to the original design so the only way is buying vintage. The good thing about the OMEGA Speedmaster ‘Moonwatch’ is that – although the ‘Professional’ version went through a few small changes – it stayed the same watch. You can’t go wrong with either a brand new Speedy Moonwatch or a vintage piece with the old 321 caliber, although we have our preferences.